I wasn’t entirely sure I was going to review this meal until I tried the rabbit. The place looks like a regular restaurant, smells like it too. However, this is a live-action training ground for Newcastle College’s NVQ level 2 and 3 students. On the way there, Mrs Diner had warned me: the food is bound to be, well, amateur at best, so if you are going to review it, go easy on them. I wondered how I could refrain from throwing my usual pot of snarky put-downs at them, and yet remain honest. Then, as I say, the rabbit arrived, smelling absolutely delicious, and the review wrote itself. This was actually one of the more enjoyable meals I’ve had this year, one in which good raw materials were subjected to plenty of solid technique. Moreover, it was ridiculously good value. 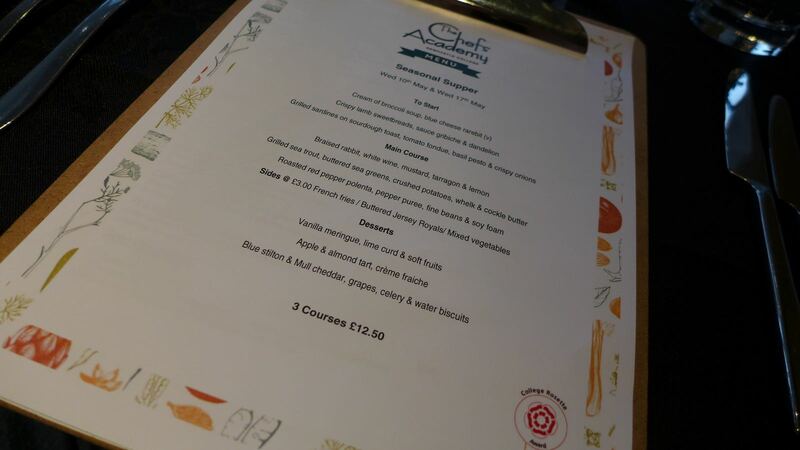 The Chefs’ Academy is, for anyone who would like to encourage tomorrow’s Michelin-botherers, well worth a look. The setting certainly helps. The lift whooshes you up to the third floor. 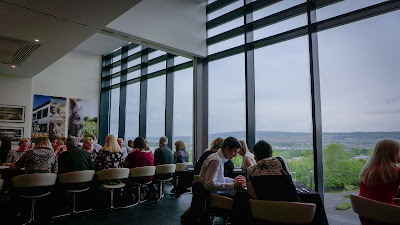 Turn left and you find yourself peering out through floor-to-ceiling glass onto a fabulous view over the Tyne Valley. Other than SIX at the top of the Baltic, I’m struggling to think of a more sweeping vista for dining. The restaurant itself is all neat modernity, with comfy off-white chairs, clothed tables, tiled flooring and walls enlivened by a few colourful pictures of pigs, bread and the like, just to get you in the mood. If you are planning to visit, ringing up or checking the website is essential as they have different menus on different days. Lunch is served Tuesday to Friday, with dinner available Wednesday and Thursday. We visited on a Wednesday, for a “Seasonal Supper” table d’hôte offering three choices per course. It’s also only open in term-time, which means this review is a bit of a tease – the end of term is next week, so it closes on the 23rd. 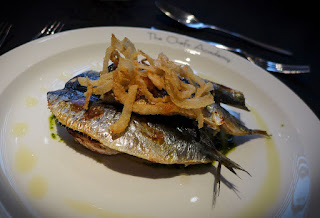 My starter of sardines on toast was a straightforward winner. The fish was fresh and rich, its silvery skin blistered slightly from the grill. Some more tomato fondue would have been nice and neither was there enough pesto on the plate to stand up to the strongly flavoured fish, but no matter: sardines are criminally underused in modern restaurants, so cheers to whoever put them on this menu. And double cheers to whoever made the sourdough underneath those sardines, with its fine crust and waxy crumb. 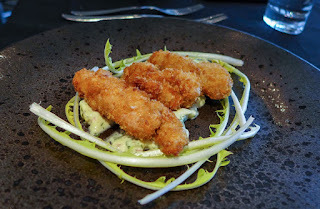 Elsewhere, lamb sweetbreads had been crumbed and fried for exactly the time it takes to become crisp outside but remain melting within. They sat on a smear of bracingly tangy sauce gribiche, garnished with a few bitter dandelion leaves. 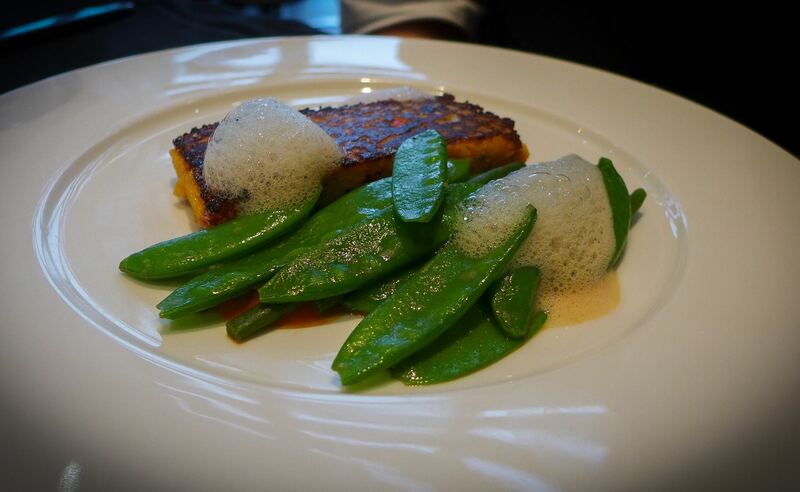 A dish of uncomplicated French-inspired pleasure. 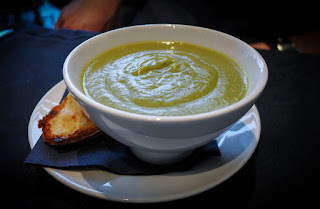 For the sole vegetarian in our party, a bowl of broccoli soup was fine, although a bit more blue cheese on the accompanying rarebit would have been appreciated. That review-clinching rabbit dish was the culinary highlight of the evening. One of my companions, being a keen shot, currently has about two hundred of the things in his freezer. He poked around at it before declaring it to be a cut from the upper leg. Rabbit gets dry very easily, but the mild flesh was perfectly moist, lubricated further by a good sauce of mustard and white wine. 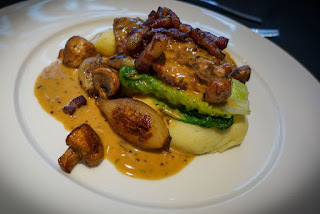 A rather Burgundian garnish of bacon, baby onions and button mushrooms, and a dollop of good mash rounded out a really enjoyable plate. Back in veggie-land, a slab of red pepper polenta was well received. Its accompanying splodges of soy foam made rather odd companions, but they at least held their form well, showing, unlike our government, no sign of collapse. 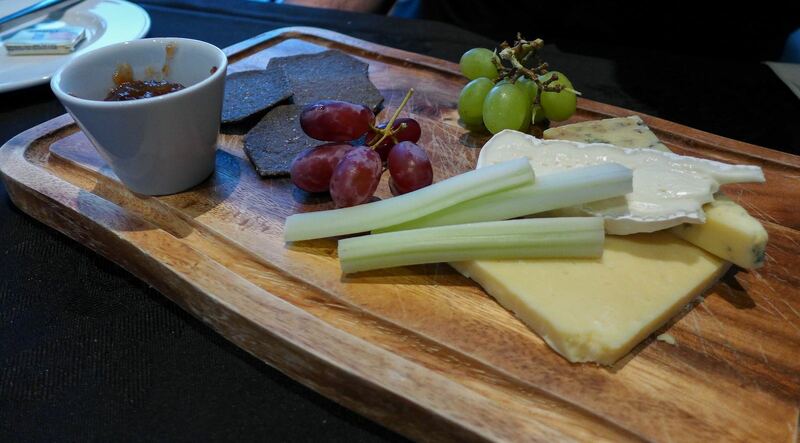 We washed all this down with a bottle of favourably savoury Chateau L’Eglise, a young but balanced Bordeaux. This was served, like everything else, with politeness and charm. You won’t have to look too hard to see a spot or two of nerves from the youthful staff, and they haven’t got their ad-libs sorted just yet, but who cares: we were looked after better here than at any number of “proper” restaurants in town. My dessert, because I have to be a bit of a git about something, wasn’t all that flash. 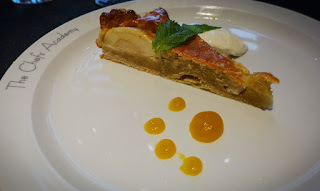 A thin sliver of apple and almond tart was characterised by some slightly underdone pastry and apples that lacked much flavour, although the frangipane style filling was pleasant. A cheeseboard that included the indomitable Isle of Mull cheddar, along with brie, Stilton and some rather fine chutney, was made even better by being served at room temperature: hurrah! The price for all this? 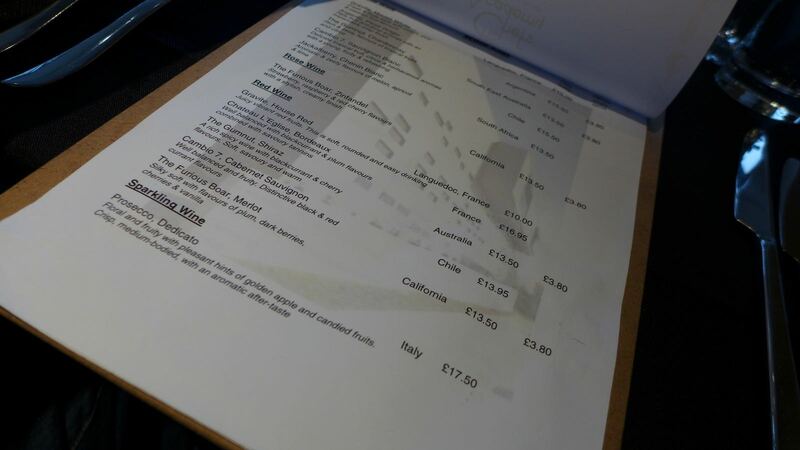 £12.50 for three courses, plus a further £17 for the booze. This would be cracking value even if the meal had been littered with errors and brave-but-failed experiments. But it wasn’t. It was a procession of tasty platefuls, featuring quality ingredients served with enthusiasm in front of one of the best views in Newcastle. Some dishes were quite simple and others weren’t quite the finished article, but as a whole the meal worked, and the bill was stupendously reasonable. I had been meaning to try out the Chef’s Academy for ages. I’m really heartened by what we found. I hear from a friend who works at Newcastle College that it tends to get used as an up-market canteen by the College staff. It’s too good to let them have it all to themselves. By eating and leaving feedback here you’re doing your bit to encourage and develop the culinary titans of tomorrow. And on this evidence, the future of the North East’s restaurant scene is in pretty good hands.